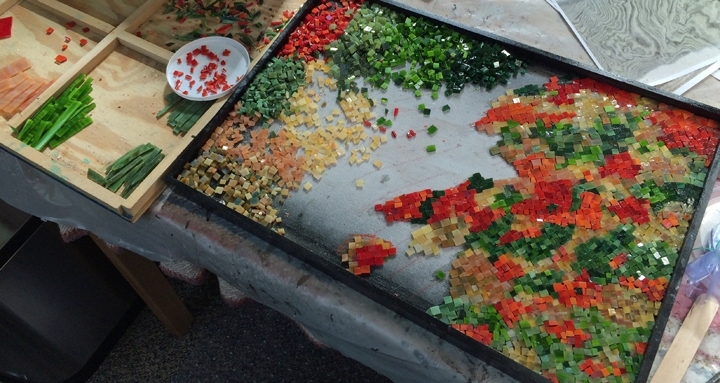 Artists who choose to work in mosaic do so for a myriad of personal reasons, but one reason will be shared by each — the selection, placement, and resulting combination of individual materials on a substrate provides the artist and viewer with a sensory experience unlike any other art form. 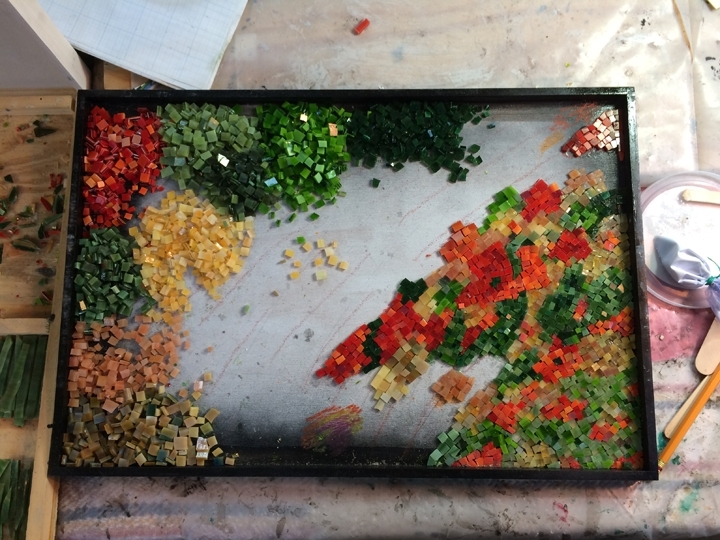 Many artists working in mosaic are accomplished painters and sculptors, and they come to mosaic with those traditions leading them. 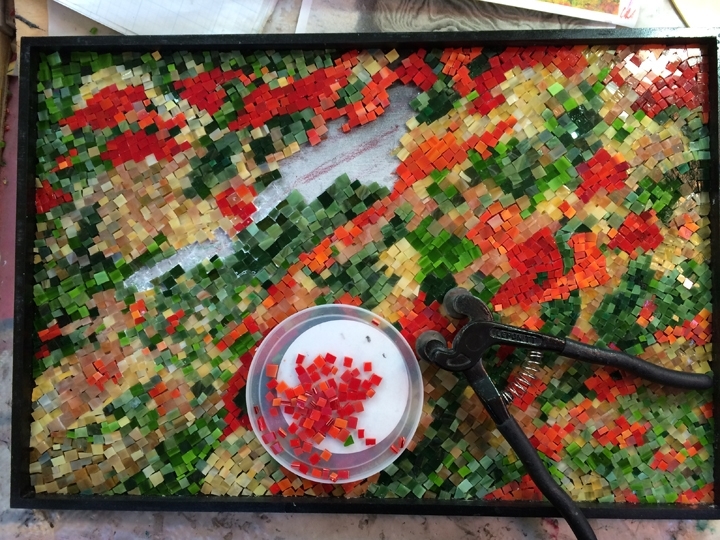 Mosaic adds a whole other dimension to their work. For many artists working in mosaic, the technical challenges of mosaic drive them. I know that’s a big part of my personal selection of the art form. 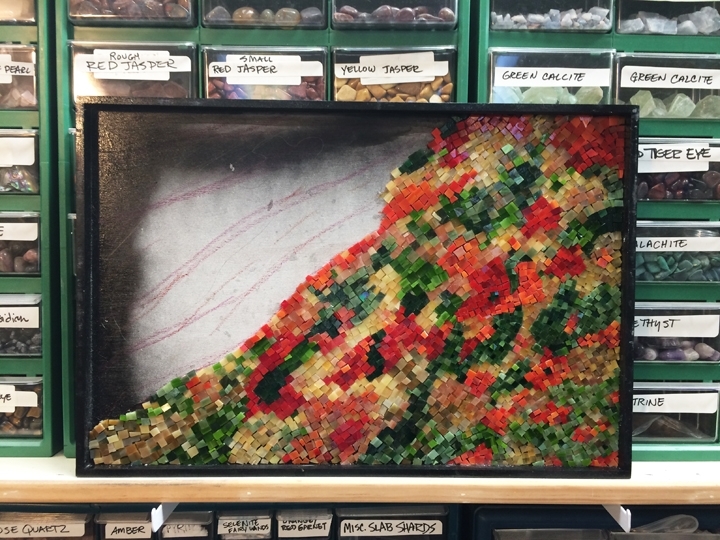 The act of creating a work of art in mosaic can be very physical… from material selection, to material manipulation and use. For the past couple of years, I’ve been working on a series of four small works (the four seasons) for a very patient couple. A couple of months ago, I collected random images from Google that visually described fall color in the Blue Ridge mountains. The people buying these works had expressed an interest in what they viewed as abstraction of a recognizable image. Like the piece that they bought originally (Sea of Green), I wanted to express “fall” through an impression of a singular glimpse from my environment. I selected glass from my stash, and then I went to work cutting. 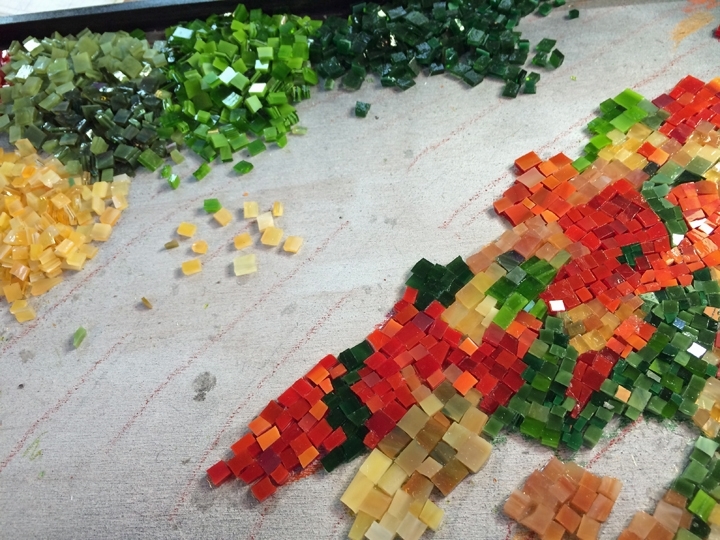 As I had decided with the two previous pieces (Sea of Green, representing Summer, and The Red Gate, representing Spring), I cut the glass into very small square-ish pieces. I did not make any effort for the pieces to be uniform. 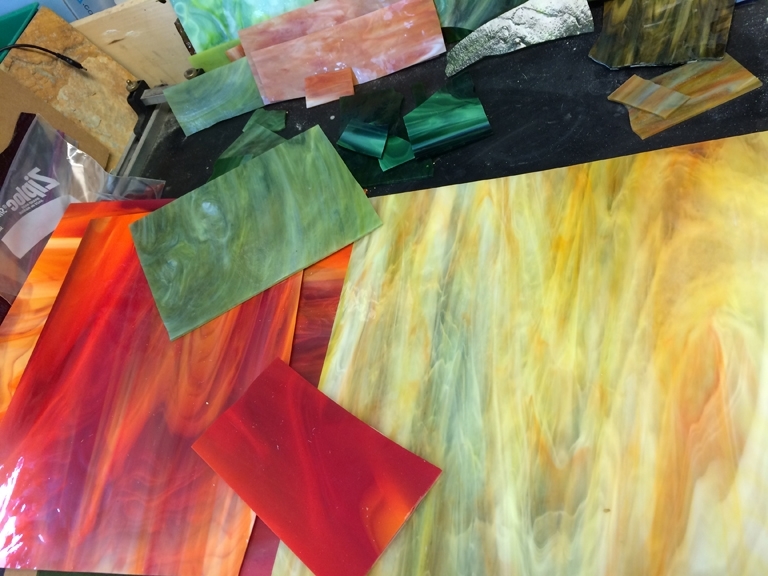 I let the irregularity of the color in the glass add movement to the work. Some areas are blended, others more solid, like the fall color of the Blue Ridge from a distance. There’s no definition of trees, just an impression using color. Never ask an artist how long it takes them to produce a work of art. The question may seem interesting, but it has no value… the amount of time invested by an artist has absolutely nothing to do with the monetary value of the work they’ve produced. This entry was posted in Just conversation on October 16, 2015 by Virginia.